- IRAN – Decius - Iranian archaeologists have started to renovate the old mosque of the ancient city of Decius, which has been unearthed in the central province of Kerman. The mosque was completely unearthed during the fourth phase of Decius excavations project in the north of the historical city of Jiroft in Kerman province. “There is no historical basis for choosing the name Decius for the city and the name was chosen by the people of the region because of the site's antiquity and historical significance,” said the head of Decius archeological team, Hamideh Choubak. Outstanding decorations such as turquoise and red inscriptions, floral patterns and Kufic inscriptions of Qur'anic verses have been discovered in the mosque, which dates back to the Safavid dynasty. Archaeologists have also found the city's public bath, with more than 12 separate sections and a special royal sector. As one of Iran's major trading and economic hubs, Decius had connections with Eastern countries. The worldly known Italian traveler Marco Polo called Decius, in his travel diary, a large and glorious city. 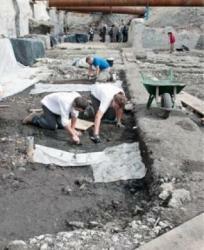 Meanwhile, Decius spreads around 12 square-kilometers, only 2 square kilometers of which have been excavated so far. 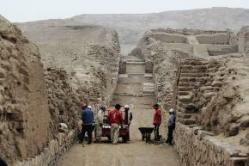 - PEROU – Pachacamac - A group of archeologists, lead by Katiusha Bernuy, recently discovered the entry to the Calle Norte –Sur (North-South street) of the temple of Pachacamac, in southeast Lima. Such entry would be the original entrance to this pre-Hispanic center. Exploration works, which are part of the Pachacamac Management Plan Project, suggest that the Calle Norte –Sur dates back to 1380 to 1440 D.C. This street was an important route to the temple complex, which was defined and delineated by tall walls of stone and adobe. The road currently is 332 meters long and between 2 and 4.7 meters wide. In addition, the archaeologists found the tomb of an important figure with cranial deformation, surrounded by women, and who was buried with a ceremonial kero, textile and vessels. Also, a gigant spondylus and a bone carved with a feline face were found. - FRANCE – Bordeaux - Au temps d'Astérix, le quartier de Mériadeck était plus actif qu'on ne le croit. Contrairement à ce qu'on pouvait lire jusqu'ici dans les livres d'histoire, le cœur administratif de Bordeaux abritait un atelier de tanneurs gallo-romain et peut-être même des moulins. Les archéologues ont fait cette découverte dans le sous-sol de la rue Jean-Fleuret, à l'emplacement du futur immeuble de la CUB. Ces fouilles d'urgence, réalisées par l'Institut national de recherches archéologiques (Inrap), se déroulent jusqu'à la fin du mois de juillet. Pour l'Inrap, la moisson est « exceptionnelle » : fragments d'amphores, bois, cuirs, insectes et des milliers de graines datant des Ier et IIe siècles après J.-C. Très fragiles, ces vestiges sont ici en excellent état : « C'est grâce à l'humidité du site, qui se trouve dans le lit du Peugue (affluent de la Garonne) et qui s'est transformé en marais aux siècles suivants », explique Christophe Sireix, responsable d'opération à l'Inrap. « On ne pensait pas que le Bordeaux gallo-romain s'étendait jusque-là et nous sommes très heureux de cette découverte. C'est un ensemble assez unique en Gaule », souligne-t-il. Par ailleurs, les graines retrouvées en quantité impressionnante vont permettre d'en apprendre davantage sur les techniques agricoles, ainsi que sur les espèces de plantes au temps des Gaulois. Malgré sa richesse, le site devra être remblayé dans quelques semaines. « On ne peut pas l'exposer, car les vestiges se détériorent très vite », observe Dany Barraud, conservateur régional de l'archéologie. « Il faut arroser constamment, sinon les cuirs et les bois éclatent ». Les amphores retrouvées à Mériadeck proviennent de l'île de Lipari, au nord de la Sicile. Cette découverte démontre l'existence de circuits commerciaux entre Bordeaux et l'Italie, à l'époque gallo-romaine, par voie maritime ou fluviale. - IRLANDE – Rush - Ancient skeletal remains have been uncovered by contractors working on the largest energy project in the country. The unrecorded burial ground was discovered on farmland in Rush, north Dublin. Several skulls and bones were recovered on the strip of land near Rogerstown estuary, which locals historians believe could date back to the Vikings in the 9th century. An on-site archaeologist has informed the National Monuments Service and is expected to be given the go-ahead to carry out a full archaeological survey next week. It is not yet known how many bodies are buried there or exactly what era they date back to. - ROYAUME UNI – Stratford upon Avon - Director of the Institute for Human Evolution, anthropologist Francis Thackeray has formally petitioned the Church of England to allow him to exhume the body of William Shakespeare in order to determine the cause of his death. Thackeray is best known for his controversial suggestion nearly a decade ago which pointed to the possibility that Shakespeare had been a regular cannabis smoker. Utilizing forensic techniques, Thackeray examined 24 pipes which had been discovered in Shakespeare’s garden and determined that they had been used to smoke the drug. Citing that even after 400 years, Shakespeare is still one of the most famous people in history, Thackeray hopes to be able to end the question of how he died and establish a health history. With new state-of-the-art computer equipment he hopes to create a three dimensional reconstruction of Shakespeare. The hope is to be able to determine the kind of life he led, any diseases of medical conditions he may have suffered from and what ultimately caused his death. The new technology, nondestructive analysis, will not require the remains to be moved but will instead scan the bones. They are also hoping to collect DNA from Shakespeare and his wife and sister, all who are buried at Holy Trinity Church. Thackeray also hopes to find evidence to back his controversial claims years ago regarding Shakespeare’s marijuana smoking. Examining the teeth could provide the evidence they need. If they are able to discover grooves between the incisor and canine teeth, it could show them he was chewing on a pipe. This plan however goes against the final wishes of Shakespeare himself who had the following words engraved on his tomb: “Good frend for Jesus sake forebeare, To dig the dust encloased heare, Bleste be the man that spares thes stones, And curst be he that moves my bones.” The Church of England denies that any requests have been made to exhume Shakespeare’s body but Thackeray and his team hopes to gain approval in time to be able to make the determination before the 400th anniversary of his death in 2016. - ROYAUME UNI – Edimbourg - Scientific equipment dating back to the 18th century and believed to have been owned by a leading Enlightenment figure has been uncovered in an archaeological dig at the University of Edinburgh. The items uncovered include laboratory apparatus and brightly coloured chemicals, which were almost certainly the property of Joseph Black, a professor of chemistry best known for his discovery of carbon dioxide gas. Also included in the discovery which was described as a very unusual find, are samples of mercury, arsenic and cobalt, together with glass tubes and other vessels, bottle stoppers and thermometers, storage jars, and ceramic distillation apparatus made by Josiah Wedgwood. Archaeologists have already unearthed remnants of the buildings close to the spot where Henry Stuart, Lord Darnley - the second husband of Mary Queen of Scots - was murdered. Excavation director Tom Addyman, of Addyman Archaeology, explained that the team had not expected to find such a large amount of artefacts. "We very strongly suspect that many of these items belonged to Joseph Black as they date back to 1766, when he was working at the college." "We have also found some very interesting ceramics, a type that so far is pretty much unrecorded, and we believe they were sent by Josiah Wedgwood. They are of the right date. "This suggests a direct link between Black and Wedgwood and is the first physical evidence linking these two great minds of the 18th century." Black was a student at Edinburgh from 1752-54 and went on to become Professor of Chemistry in 1766. He was a key figure in the Enlightenment and was an associate of Adam Smith and David Hume, among others.